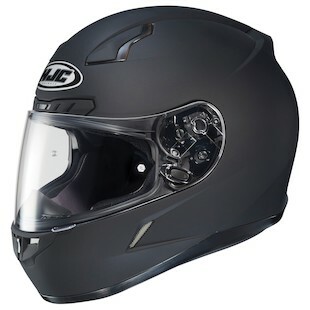 HJC CL-17 Helmet: Entry Level +1! So you want to be safe, you understand the importance of good headwear, but you just can't justify the prices of some of the premium helmets out there! Enter the HJC CL-17 Helmet. An aptly-named replacement to the HJC IS-16, the IS-17 carries both DOT and Snell 2010 safety ratings for a shockingly low price. Who said "entry level" has to be a bad thing? The CL-17 Helmet comes standard with all the basic features you would expect on a mid-range helmet, including an advanced ventilation system, removable/washable interior, and a quick-change faceshield that is both pinlock ready and locking. The Polycarbonate shell saves weight, giving this lid an edge on comfort and fit. Your color choices aren't limited either! The solid colors are available in Black, Matte Black, White, Silver, Wine, and Matte Anthracite, while a plethora of graphics spice things up, like the Victory colorway seen here. 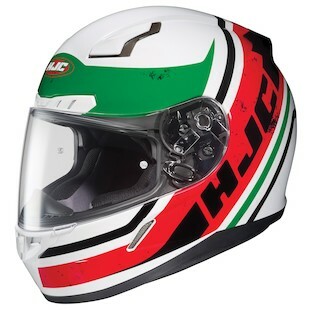 Explore all of the HJC CL-17 Helmets at entry level prices at RevZilla.com!